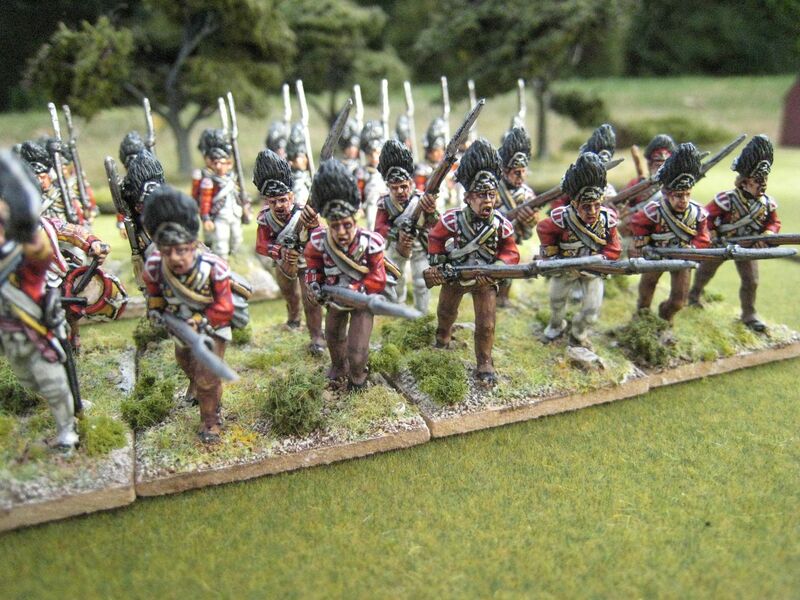 This is my second "reinforcements" post and it gives me an excuse to think about British grenadiers. I'll start with the basics. These troops served in composite battalions that combined the grenadier companies of the various regiments serving in the Americas. These combined units did not carry colours and were often much larger than in strength than the parent line battalions (as they contained more companies). 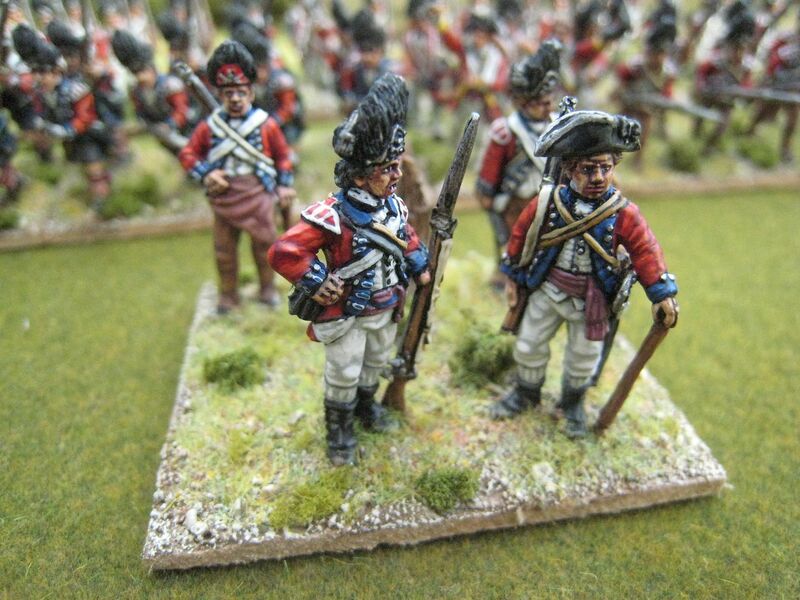 At the beginning of the AWI there were two combined battalions of grenadiers, expanding to four in 1776. In October 1776 the 4th Grenadiers were disbanded due to high rates of sickness, with the 42nd Foot's grenadier company being transferred to the 3rd Grenadiers. During the northern theatre battles of 1777-78, the main army had two large battalions and Burgoyne's 1777 Saratoga army had a battalion of just under 600 men. The grenadiers shrank once major operations in the north ceased and there appears to have been just one battalion in the South. 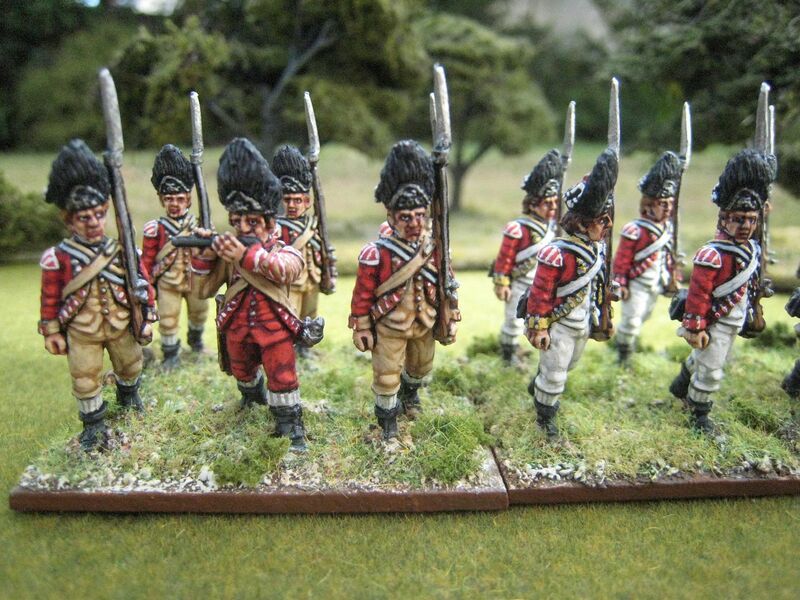 I suppose there are three issues that might concern an AWI wargamer when considering how to add some grenadier units to his/her collection: size, facing colours and headgear. The last is probably the easiest issue to address: there is evidence that bearskins were worn in the war's earlier years, and further evidence that they were put into storage in later years, from 1779 or thereabouts, if not earlier (and quite probably during the Saratoga expedition as well). But realistically, who is going to pass on having these iconic troops in their full finery? So bearskins all round. So a unit of 24 figures will cover over half the scenarios, and many gamers will be satisfied with that. It's when you look at the larger battles that numbers get a bit sticky. 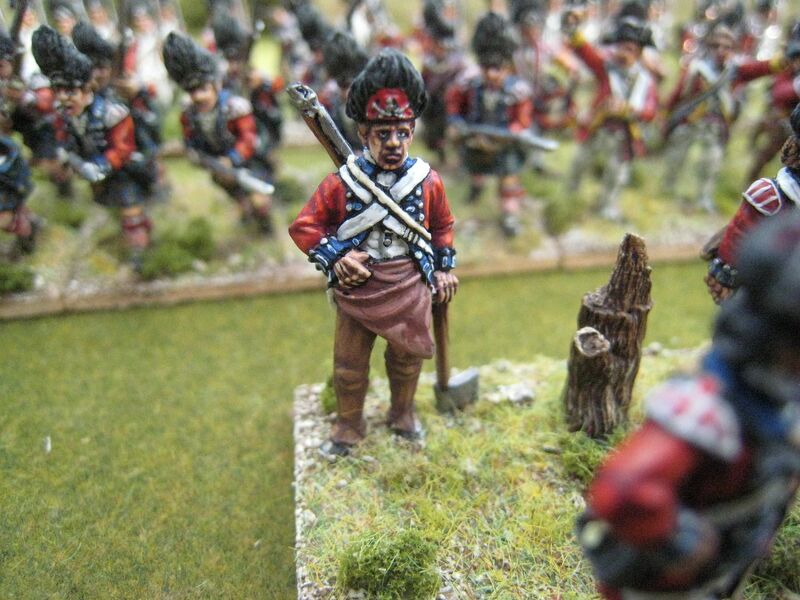 There are five scenarios in which the 1st Grenadiers and the 2nd Grenadiers both appear and two of those also feature the 3rd and 4th Grenadiers. 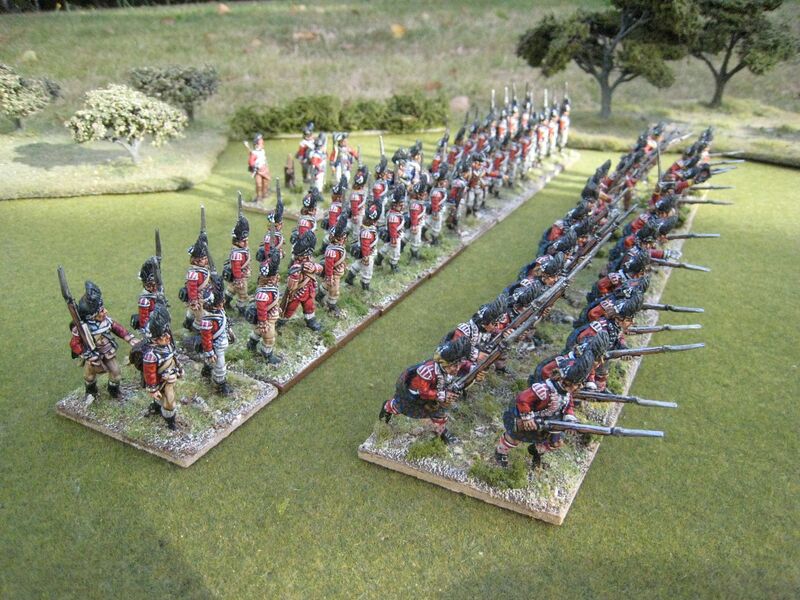 So the most grenadier figures you need at one time, for Long Island or Haarlem Heights, is 72. 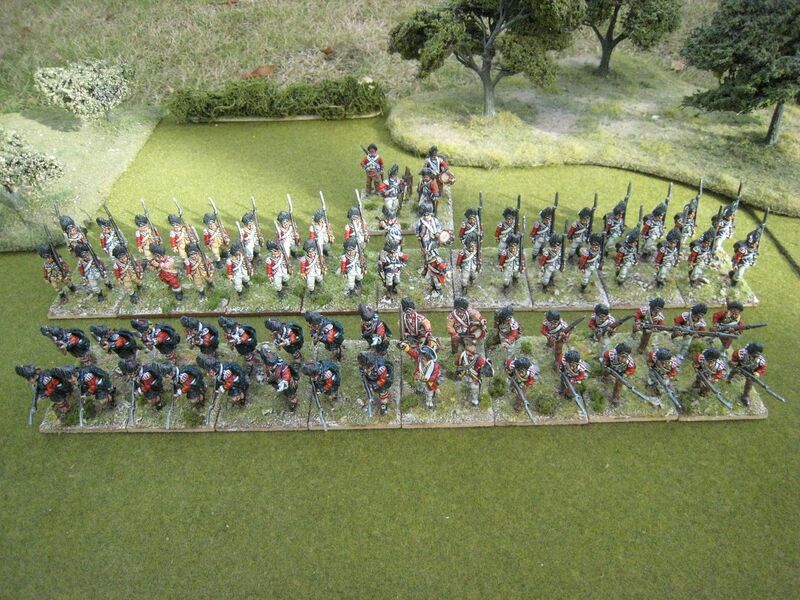 I painted the 3rd and 4th Grenadiers for a Long Island game back in 2008 (together with a command stand). 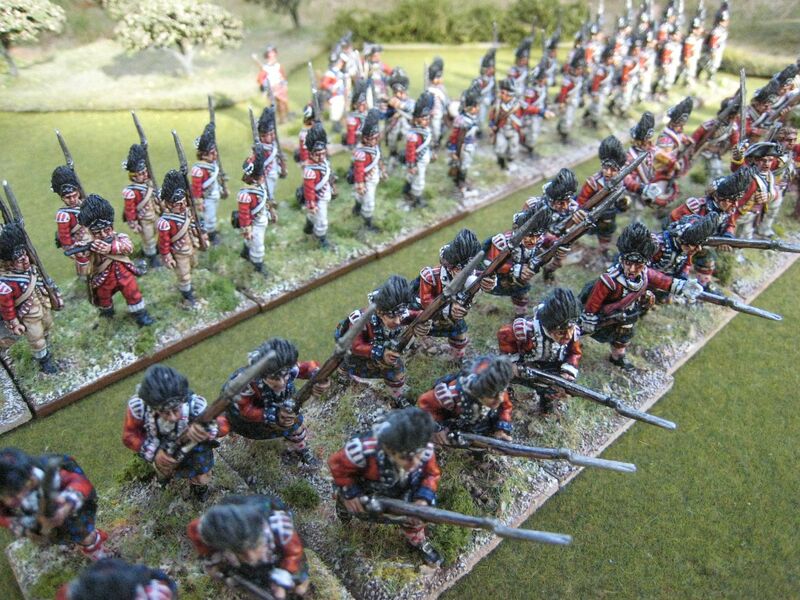 Those 16-figure units, both in charging poses, helpfully combine to form the 2nd Grenadiers for Brandywine, Whitemarsh and Monmouth. 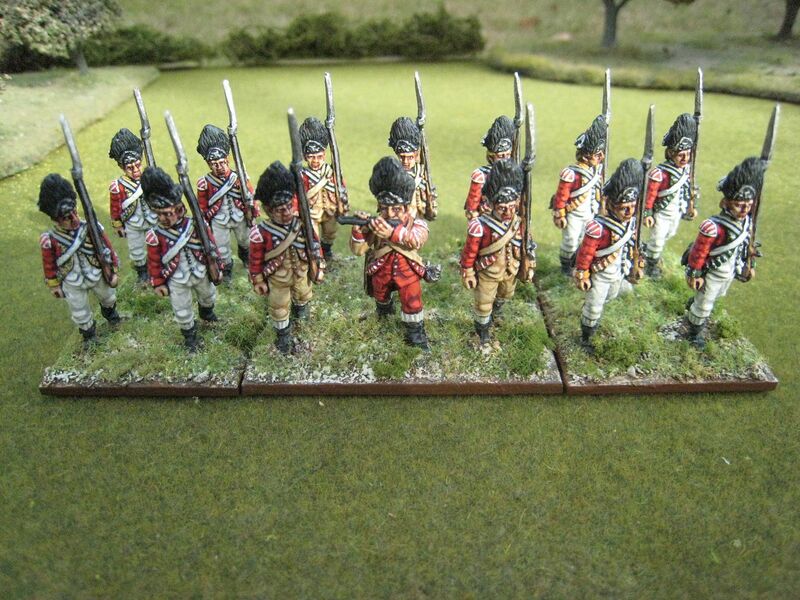 My existing 1st Grenadiers, in marching poses, was 24 figures, so that needed bulking up to 32 anyway. But I then looked at the other scenarios and thought I might as well just another 8 figures to bring the unit up to 40 so I could use it as both the 1st and 2nd Grenadiers for Long Island and Haarlem Heights. - 4th, 5th, 10th, 18th, 23rd, 38th, 43rd, 47th, 52nd, 59th. 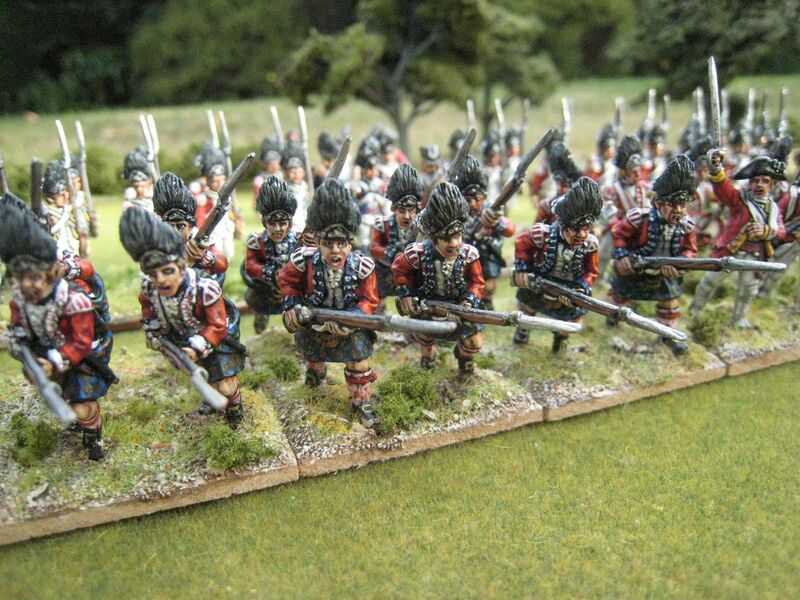 - 4th Grenadiers: 42nd (one double-size company) and 71st highlanders (three companies). - Burgoyne's Saratoga army: 9th, 20th, 21st, 24th, 29th, 31st, 34th, 47th, 53rd and 62nd. Trying to replicate the precise configurations of these combined battalions would therefore require a lot of extra figures to ensure that the correct regiments were represented. The easiest way is probably to stick to just one pose, whether marching, charging or firing, as that would then allow you to mix and match more extensively. I'm constrained by having one large unit in charging poses and the other in marching poses. 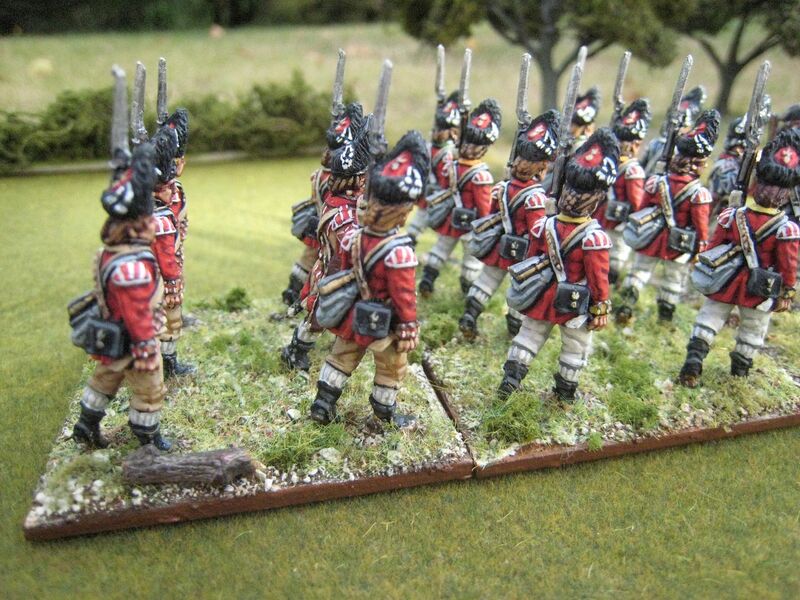 So combining my 3rd and 4th Grenadiers to form the 2nd Grenadiers at Monmouth, for example, doesn't really work as 42nd's grenadier company was with the 1st Grenadiers and the 71st's had been sent to New York. The approach I've taken with the larger units to ensure the numbers are correct without worrying too much about the facings. That said, the most common facing colours were yellow and dark green, so you can't go too wrong with lots of figures in those colours (looking at the 1st Grenadiers in 1777/78, for example, you have four companies with yellow facings, three with dark blue, two each with buff and dark green, one each with orange, white and red; of the seven companies in the 3rd Grenadiers in 1776, five had yellow facings). The facing colour that is most noticeable is buff, because that means the colours of the smallclothes and cross-belts should be buff too. I already had a couple of buff-faced figures in my existing 1st Grenadiers, but with an eye on the Eutaw Springs scenario I decided to paint a new base of 6 figures, including a Foundry fifer, to represent the 3rd Foot's grenadier company (and which I could then combine with two 4-figure bases to make the 14-figure unit required for that scenario). The figures here are mainly from Perry Miniatures, but with some older Foundry ones too. 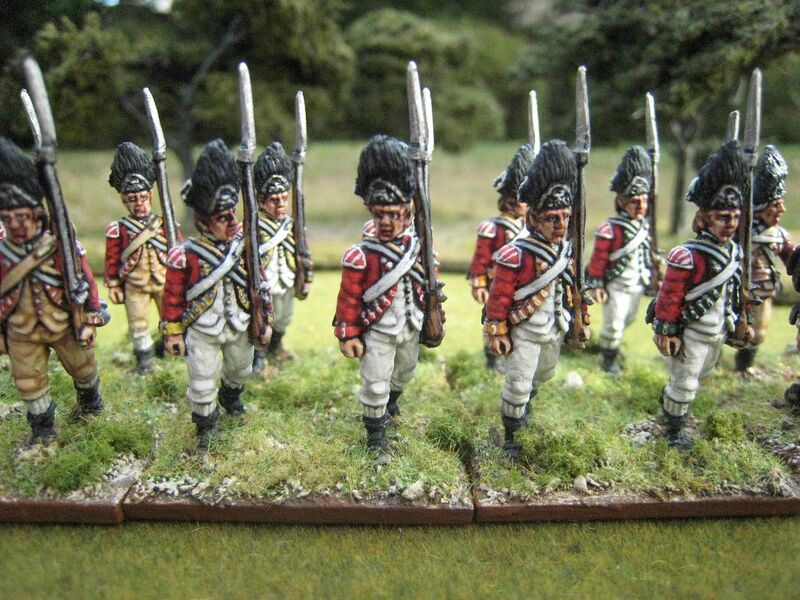 Fife & Drum also make some nice grenadier figures. I tidied up the older figures, which had a few daft painting mistakes. 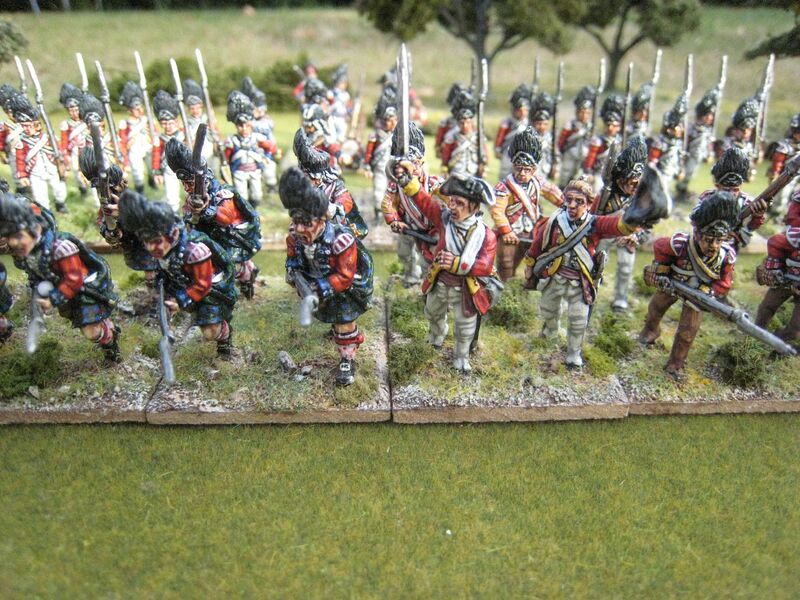 So that's my brigade of British Grenadiers. If I wanted to go absolutely nuts, I could do some more troops in "Saratoga caps" specifically for the Saratoga battles, but that would be right at the back of the list (I'd use Perry plastic figures, although they don't have flank company shoulder wings; but then did the grenadiers remove those wings before the campaign began....?). 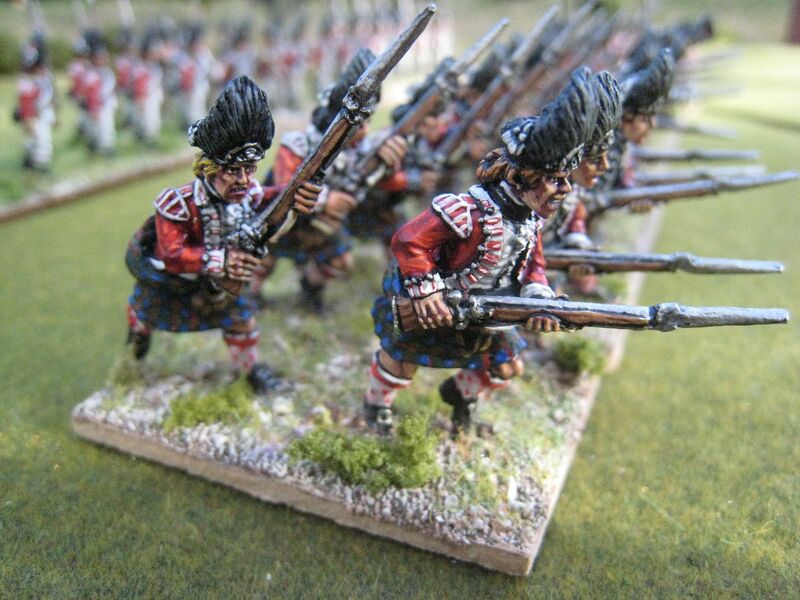 My next batch of "reinforcements" will be British in campaign dress, but those will have to wait until later in the year. I appreciate that the blog has been quite of late, but I'm now back in business and there is much more AWI to come shortly. 14 figures. Painted August 2016. Below are some other photos of the complete "brigade" out in the sun. 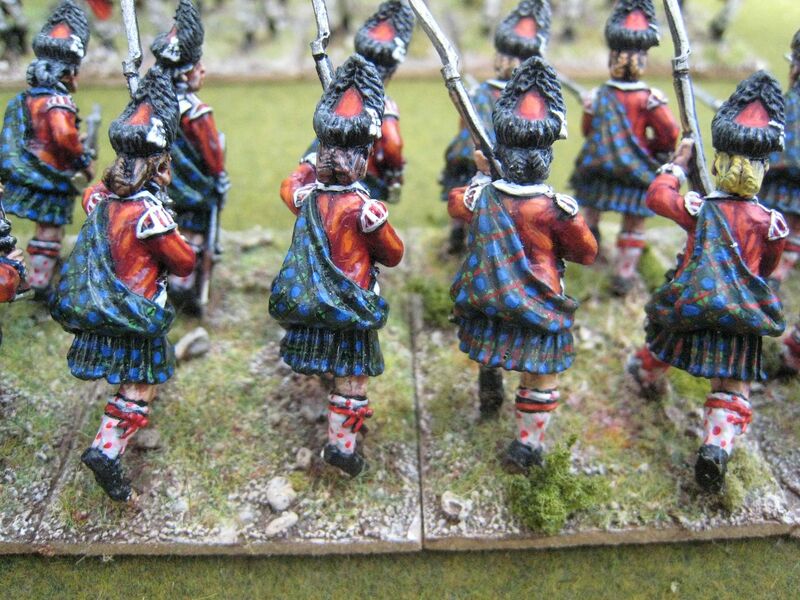 The second battalions of the 42nd and 71st have a red stripe in their plaid.